In its wisdom to adequately represent the late Chief Obafemi Awolowo in a new statute, Poly 3D Art Studios, commissioned by the Lagos State Government for the work decided that the figure of the former Premier of the defunct Western region should be artistically presented in a sitting position rather than a standing posture and to have it wearing a Timberland boots to boot! This artistic sense of the sculptors to hide Awolowo’s feet in a laced boot and not shoes appears not to have currency with many admirers of the late politician and lawyer. Since the 20-foot-tall sculpture was unveiled last week in Ikeja by the Lagos State Governor, Akinwunmi Ambode, it has received many knocks that could literally knock it down to its feet. The idea behind the work, according to Hamza Atta, the CEO of Poly 3D Art Studios in an interview with the City People, was for his team to come up with an original work of art, devoid of copying the existing art works of Awolowo; and to bring out the mental magnitude of the Sage to inspire youths to greatness. The 20ft high sculpture is made of steel and polystyrene, coated with hard coat for weatherproofing, and painted with bronze paint that took three months to complete. However, critics are not impressed with this statue, which they believe fell short of correctly representing the high status of Chief Obafemi Awolowo. 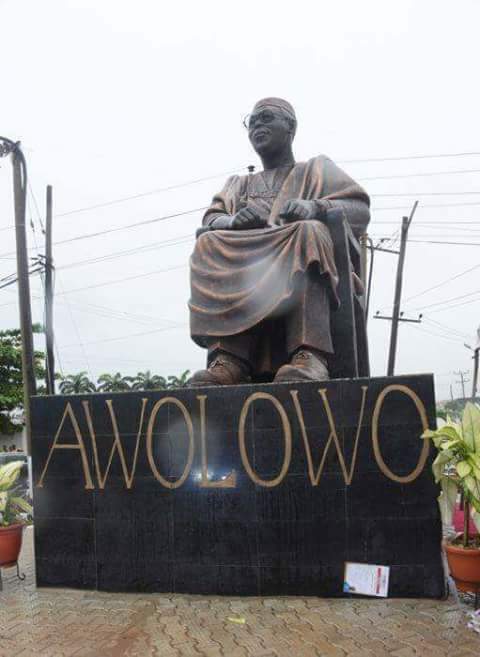 Many took to the social media to lash out at both the sculptors and the Lagos Sate government, calling the statue of Awolowo wearing a laced boots as an affront on the personality of the sage and the culture he was proud to represent while he was alive. In its defence, the Lagos State Government through the Special Adviser to the Governor on Tourism, Arts and Culture, Mrs. Adebimpe Akinsola took to the state government’s official facebook page to explain that many previous sculptures have shown other personal traits of the sage, particularly those that portray him as a ‘dogged fighter’ standing with his famous sign of victory. She said the decision to have him sitting down in boots in this new sculpture alludes to his multi-dimensional eminence. The government compared the new sculpture to the likes of Abraham Lincoln in his sitting position designed by Daniel Chester French and carved by the Piccirilli Brothers. 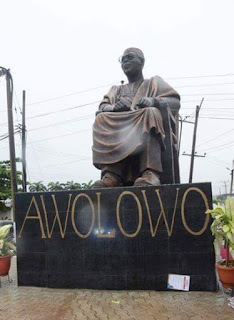 According to Mrs. Akinsola, instead of focusing only on the artistic depiction of the late Awo, critics should equally consider the intention of the Lagos State Government to inspire the young generations about his legacies with the statue. “It is a piece of artwork expressing the Artist’s impression of the late Sage and not a photograph” she said. Another critic, Tayo Maxwell, in his comment also dismissed the new sculptor as below standard “The govt people can say whatever they want to but the former sculpture is way better that this piece of cement, sand and paint put together. That's by popular opinion and not just because of the timberland laced shoes.Has Awolowo become a subject of some artist's abstract imagination? Meanwhile, the family of the late sage has applauded the statue and appreciated the Lagos State Government for the honour done to the Awolowo family. According to Mr Segun Awolowo (Jnr) “I love the statue and I think Hamza (the Sculptor) did justice to his memory. As for the large boot, I believe the symbolism is that his shoes are still too big to fill after all this while’’. News | Oke Wins 2017 NLNG Literature Prize.